Henri Grünbauer - Guitar - Saint Vitus II 1984, Tejater Kikker, Utrecht. New material was written and early 1984, auditions for a new singer and drummer were held. In came Corinne Bos and Auke the Booij. A demo was recorded, Saint Vitus II was presented to the Press and there was an American contact. Saint Vitus - Make Your Move (1984) - The second Line-up of Saint Vitus produced a funkier sound with a symphonic edge. Please Stop and Make Your Move did very well. From this formation only one album came to see the light of the day in 1984. Bad promotion and mismanagement caused Saint Vitus II never really achieving further succes. Plans to conquer America of course never materialized and Saint Vitus II didn't see the year out. They found themselves without a singer for a second time. Still they didn't give up. With Lucy Berendse and René Butôt, some rehearsals were done, but they never did play live. This very obscure line-up is sometimes revered to as Saint Vitus 3. 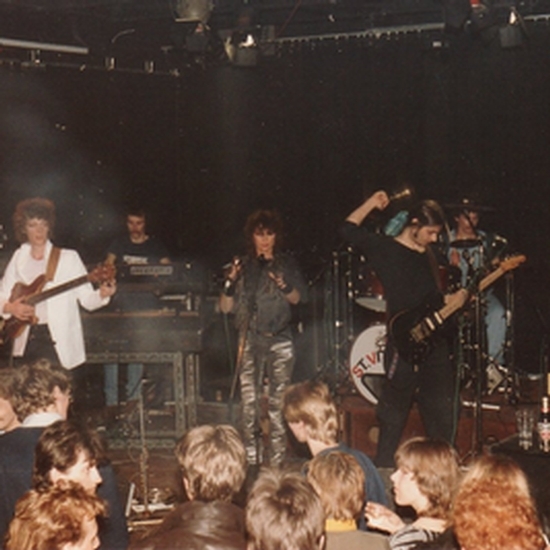 Saint Vitus II 1984, Tejater Kikker, Utrecht. New material was written and early 1984, auditions for a new singer and drummer were held. In came Corinne Bos and Auke the Booij. A demo was recorded, Saint Vitus II was presented to the Press and there was an American contact. Saint Vitus - Make Your Move (1984) - The second Line-up of Saint Vitus produced a funkier sound with a symphonic edge. Please Stop and Make Your Move did very well. From this formation only one album came to see the light of the day in 1984. Bad promotion and mismanagement caused Saint Vitus II never really achieving further succes. Plans to conquer America of course never materialized and Saint Vitus II didn't see the year out. They found themselves without a singer for a second time. Still they didn't give up. With Lucy Berendse and René Butôt, some rehearsals were done, but they never did play live. This very obscure line-up is sometimes revered to as Saint Vitus 3.